The $115 million in donations raised through the 2014 ALS Ice Bucket Challenge spurred a massive increase in The ALS Association’s capacity to invest in promising research, the development of assistive technologies, and increased access to care and services for people with ALS. Since 2014, we have committed more than $108 million toward our mission, including over $89 million committed specifically to worldwide research collaborations. The ALS Association is committed to transparent and accessible reporting on the way Ice Bucket Challenge funds are allocated. Below are links and dollar commitments associated with projects and initiatives that the Association is funding with donations received through the Ice Bucket Challenge. 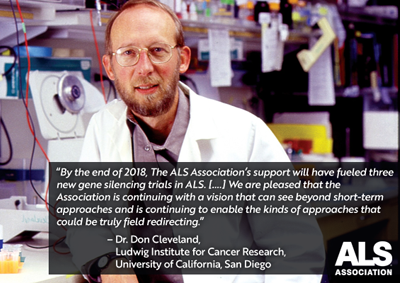 Along with receiving tremendous help from volunteers, we are committed to maximizing all donations from the ALS Ice Bucket Challenge and beyond by partnering with other organizations to fund the most promising global ALS research. These figures will be updated periodically as new commitments are added. For questions, please contact inquiries@alsa-national.org. For more information about our premier global research program, check out our mission toolkit here. Dr. Sharon Abrahams, University of Edinburgh: $239,877. Cognitive change and ALS staging: the relationship between cognitive and motor system involvement in ALS. Dr. Ammar Al-Chalabi, King’s College London: $120,000. Corticospinal motor neuron developmental control genes as candidates for human ALS susceptibility. Dr. Robert Brown, University of Massachusetts Medical School: $1,000,000. Development of AAV-mediated SOD1 gene silencing therapy in ALS. Dr. Benjamin Neale, Massachusetts General Hospital: $115,000. Familial ALS exome capture and genome sequencing. Dr. Jeffrey Macklis, President and Fellows of Harvard College: $39,990. Corticospinal motor neuron developmental control genes as candidates for human ALS susceptibility. Dr. Timothy Miller, Washington University in St. Louis: $326,662. Understanding clinical phenotype and collecting biomarker samples in C9ORF72 ALS. Dr. Raymond P. Roos, The University of Chicago: $80,000. Palmitoylation of SODI and the pathogenesis of ALS. Dr. Clive Svendsen, Cedars-Sinai Medical Center: $1,000,000. Inflammatory biomarkers, stem cells and DNA in people with ALS. Dr. Ludo van den Bosch, VIB vzw: $80,000. Role of histone deacetylase 6 (HDAC6) in amyotrophic lateral sclerosis. Dr. Phillip C. Wong, Johns Hopkins University: $50,000. Validation of a therapeutic target in TDP-43 animal models of ALS. Dr. Zuoshang Xu, University of Massachusetts Medical School: $100,000. AAV therapeutic agents for ALS. Dr. Ellen Langer, The President and Fellows of Harvard College: $156,145. An online mindfulness intervention for people with ALS and their caregivers. Dr. Bjorn Oskarsson, The Regents of the University of California: $48,000. Mexiletine for the treatment of muscle cramps in ALS. Dr. Christine Beattie, Sfida Biologic, Inc.: $40,000. Evaluation of novel ?-Secretase modulators in a Zebrafish ALS model. Dr. Luc Dupuis, INSERM: $55,000. Understanding the genetic mechanisms of FUS-mediated ALS through a conditional knock-in mouse model (renewal of grant #2235). Dr. Elizabeth Fisher, UCL Institute of Neurology: $80,000. Humanized delta14 mutant mouse model for dissecting the pathobiology of FUS-ALS. Dr. Tania Gendron, Mayo Clinic Jacksonville: $240,000. Mechanisms of c9RAN protein-induced neurodegeneration inc9FTD/ALS. Dr. Anne Hart, Brown University: $240,000. Precise C. elegans models of ALS. Dr. Muralidhar Hegde, The Houston Hospital Research Institute: $40,000. TDP-43 pathology - mediated DNS repair deficiency in ALS. Dr. Eliahu Heldman, Ben Gurion University of the Negev: $80,000. Treatment of ALS by targeted delivery of GDNF to motoneurons using novel V-SmartTM nanovesicles. Dr. Clotilde Lagier-Tourenne, Ludwig Institute for Cancer Research: $25,000. Understanding the genetic mechanisms of FUS-mediated ALS through a conditional knock-in mouse model (renewal of grant #2235). Dr. Thomas Lloyd, Johns Hopkins University: $80,000. Cognitive change and ALS staging: the relationship between cognitive and motor system involvement in ALS. Dr. Giovanni Manfredi, Weill Medical College of Cornell University: $240,000. Metabolic biomarkers in skin fibroblasts of sporadic ALS patients. Dr. Nicholas Maragakis, Johns Hopkins University: $240,000. Investigating astrocyte-mediated degeneration of upper motor neurons in ALS. Dr. Mary-Louise Rogers, Flinders University: $160,000. A urinary biomarker to track progression of ALS in humans. Dr. Hanna Rosenmann, Hadassah Hebrew University Medical Center: $40,000. CSF exchange therapy in ALS: removal of endogenous CSF and replacement with biologically enriched artificial CSF. Dr. Jeffrey D. Rothstein, Johns Hopkins University: $240,000. Glial metabolic connectivity in Amyotrophic Lateral Sclerosis. Dr. James Shorter, Trustees of the University of Pennsylvania: $240,000. Defining therapeutic protein disaggregases from humans for TDP-43 and FUS in ALS. Dr. Elijah Stommel, Mary Hitchcock Memorial Hospital: $240,000. Environmental risk factors for ALS - the North New England ALS database, cyanobacteria and methyl mercury. Dr. Masatoshi Suzuki, Board of Regents of the University of Wisconsin System: $240,000. Application of human skeletal muscle stem cells to treat and understand ALS. Dr. Su-Chun Zhang, Board of Regents of the University of Wisconsin System: $240,000. Identifying drugs that restore NF levels and inhibit NF aggregation in ALS patient motor neurons. Dr. Veronique Belzil, Mayo Clinic Jacksonville: $100,000. Characterizing the contributions of epigenetic changes in c9FTD/ALS. Dr. Claudia Fallini, University of Massachusetts Medical School: $100,000. Characterizing the pathogenic role of TDP-43 in PFN1-linked ALS. Dr. Florent Laferriere, Institute of Molecular Life Sciences, University of Zurich: $100,000. Contribution of protein aggregation in the pathogenesis of ALS: seeding, spreading, and toxicity. Dr. Philip McGoldrick, University of Toronto: $100,000. Pathomechanisms of C9orf72 repeat expansions in real time. Dr. Ke Zhang, Johns Hopkins University: $100,000. The role of nuclear transport defects in the pathogenesis of ALS/FTD. Dr. Merit Cudkowicz, Massachusetts General Hospital: $154,508. Clinical trial of tocilizumab in ALS subjects. Dr. Shafeeq Lafha, St. Joseph's Hospital & Medical Center: $56,406. Clinical trial of tocilizumab in ALS subjects. Dr. Jeremy Shefner, St. Joseph's Hospital & Medical Center: $193,445. Clinical trial of tocilizumab in ALS subjects. Dr. Alex Sherman, Massachusetts General Hospital: $200,000. NeuroBANK as an accelerated clinical research environment: development, deployment and services to ALS research community. Dr. Brian Wainger, The General Hospital Corp dba Massachusetts General Hospital: $300,000. Phase 2 pharmacodynamic study of retigabine (ezogabine) on neuronal excitability in ALS subjects. Dr. James Berry, Massachusetts General Hospital: $500,000. Infrastructure improvement and biofluid collection protocols for the expansion of the NEALS biorepository. Dr. Don Cleveland, Ludwig Institute for Cancer Research: $1,600,000. A combined Ludwig/UCSD/Children’s Hospital team will undertake development of two therapeutic approaches for treatment of some forms of inherited and sporadic ALS. Dr. Steven Finkbeiner, The J David Gladstone Institute: $1,600,000. Identification and validation of therapeutic targets and development of therapeutics for ALS. Dr. Jonathan Glass, Emory University: $158,729. Project MinE US – Whole genome sequencing of a large cohort of sporadic ALS patients. Dr. Matthew Harms, The Trustees of Columbia University in the City of New York: $3,413,132. Integrated genomics in clinical ALS. Dr. John Landers, University of Massachusetts Medical School: $841,271. Project MinE US-Whole Genome sequencing of a large cohort of sporadic ALS Patients. Dr. Lyle Ostrow, Johns Hopkins University: $1,392,668. ALS Association proposal for adding biofluids to target ALS postmortem tissue Core. Dr. Hemali Phatnani, New York Genome Center: $2,500,000. Genetics and genomics of ALS – whole genome sequencing, data warehousing and analysis. Dr. Dhruv Sareen, Cedars-Sinai Medical Center: $422,400. Integrated genomics in clinical ALS: PBMC library generation. Dr. Jeremy Shefner, Saint Joseph's Hospital and Medical Center: $539,902. Fluid biomarkers with deep phenotyping in patients with ALS. Dr. Clive Svendsen, Cedars-Sinai Medical Center: $186,000. Using novel imaging agents as a biomarker for ALS progression in the fALS rat. Dr. Clive Svendsen, Cedars-Sinai Medical Center: $103,384. Application of MultiOmyx to iPSC models in ALS. Dr. Clive Svendsen, Cedars-Sinai Medical Center: $1,600,000. The ALS Association and Cedars-Sinai Stem Cell Center. Dr. Zuoshang Xu, UMass Medical School: $95,790. Developing a rapid diagnostic assay for C9ORF72 DNA repeat expansion. Dr. Jinsy Andrews, Cytokinetics, Inc.: $1,500,000. CY 4031 ALS Biomarker study. Dr. Nazem Atassi, Massachusetts General Hospital – Research: $1,378,547. Track ALS. Dr. Michael Benatar, University of Miami: $400,000. CReATe consortium biorepository for ALS biomarker discovery and validation. Dr. Andreas Jeromin, Iron Horse Diagnostics Inc: $200,000. Fluid biomarkers with deep phenotyping in patients with ALS. Dr. Joseph Masdeu, The Methodist Hosp Res Inst dba Houston Methodist Res Inst: $154,453. Track ALS. Dr. Terry Heiman-Patterson, Drexel University: $200,000. Relationship of cognitive-behavioral symptoms in ALS to caregiver burden and development of a pilot randomized controlled behavioral intervention to improve caregiver burden. Dr. Melinda Kavanaugh, University of Wisconsin-Milwaukee: $50,000. Family characteristics and youth caregiving experiences: A national pilot study of ALS caregiving. Dr. Anne-Marie Wills, Massachusetts General Hospital – Research: $200,000. E-health application to measure outcomes remotely in ALS clinical trial (EAT MORE in ALS clinical trial). Dr. Stanley Appel, Houston Methodist Research Institute: $693,333. A pilot trial of the safety and tolerability of expanded autologous regularity T cells administered by intravenous infusion in patients with ALS. Dr. Michael Weiss, University of Washington: $500,000. Effects of mexiletine on cortical hyperexcitability in amyotrophic lateral sclerosis. Dr. Hristelina Ilieva, American Brain Foundation: $86,667. Clinician Scientist Award. Dr. Severine Boillee, Institut National de la Santé et de la Recherche Médicale: $40,000. Peripheral nerve macrophages as a target to slow down ALS disease progression. Dr. Steven Burden, New York University School of Medicine: $381,480. Testing MuSK agonist antibodies in ALS mice. Dr. Paramita Chakrabarty, University of Florida: $80,000. Chemokine-based immunobiotherapeutics in ALS. Dr. Pierre Drapeau, Centre Hospitalier De L'Universite De Montreal: $496,422. Screening of neuroleptic derivatives in genetic models of ALS. Dr. Todd Golde, University of Florida: $80,000. Exploring the positive effect of rAAV-IL-10 in an ALS mouse model. Dr. Ronald Klein, Louisiana State University Health Science Center: $100,000. Therapeutic testing of KPT-350 in an adult onset model of ALS nuclear export. Dr. Clotilde Lagier-Tourenne, The General Hospital Corporation d/b/a Massachusetts General: $60,000. Determining the relative contribution of gain and loss of function mechanisms in a mouse model of FUS-ALS. Dr. Glenn Larsen, Aquinnah Pharmaceuticals Inc: $88,135. Characterization of ADME and brain metabolism of TDP-43 inclusion inhibitors. Dr. Leonard Petrucelli, Mayo Clinic Jacksonville: $500,000. Preclinical evaluation of small molecules targeting C9ORF72 repeat expansion. Dr. Melvin Reichman, Lankenau Institute for Medical Research: $240,000. Accelerating drug discovery for ALS. Dr. Jeffrey Rothstein, Johns Hopkins University: $476,621. Preclinical validation and optimization of C9orf72 targeted sense and antisense antisense oligonucleotide (ASO) therapy. Dr. Dinah Sah, Voyager Therapeutics, Inc.: $500,000. Development of an AAV gene therapy targeting for SOD1 for the treatment of ALS – translation of delivery. Dr. Clive Svendsen, Cedars-Sinai Medical Center: $345,275. Development of AAV5-GDNF (TW002) for the treatment of Amyotrophic Lateral Sclerosis (ALS). Dr. Ronald van der Geest, Treeway B.V. (LtD): $154,725. Development of AAV5-GDNF (TW002) for the treatment of Amyotrophic Lateral Sclerosis (ALS). Drs. Benjamin Wolozin and Glenn Larsen, Aquinnah Pharmaceuticals Inc: $408,466. Validating the efficacy of lead compounds that decrease TDP-43 aggregation on neurotoxicity in vitro and in vivo. Dr. Jingsong Zhou, Kansas City University of Medicine and Biosciences: $80,000. Target microbiota to alleviate ALS progression. Dr. Jill Zitzewitz, UMass Medical School: $160,000. Biomarkers and small molecule therapeutics targeted against an intermediate state in TDP-43. Dr. Elizabeth Blankenhorn, Drexel University: $240,000. Genetic modifiers of a murine motor neuron disease (G93ASOD1 Transgenic Mouse). Dr. J Ross Buchan, University of Arizona: $40,000. Defining the role of granulophagy and VCP/Cdc48 in mitigating TDP-43 toxicity. Dr. Jeff Bulte, Johns Hopkins University: $240,000. Immunomodulation and glia restoration by transplanted stem cells: Use of novel imaging biomarkers. Dr. James Connor, The Pennsylvania State University: $240,000. Limiting microglial-induced inflammation promotes neuronal survival. Dr. Gregory A. Cox, The Jackson Laboratory: $79,653. Nuclear-cytoplasmic transport and ribosomal quality control defects in ALS. Dr. Luc Dupuis, INSERM: $100,000. Determining the relative contribution of gain and loss of function mechanisms in a mouse model of FUS-ALS. Dr. David Ennist, Origent Data Sciences, Inc.: $180,000. Prospective validation of an ALS disease progression algorithm in the clinic setting. Dr. Jonathan Enriquez, The Trustees of Columbia University in the City of New York: $40,000. Genetic specification of individual motor neuron identities. Dr. Elizabeth Fisher, University College London: $160,000. A new humanized delta14 mutant mouse model for dissecting the pathobiology of FUS-ALS. Dr. Keith Gagnon, Board of Trustees of Southern Illinois University: $40,000. Flexible and accessible cell-based models of c9FTD/ALS.Dr. Javier Jara, Northwestern University: $40,000. Understanding the role of traumatic brain injury in ALS. Dr. Steven Goldman, University of Rochester: $240,000. A C9orf72 human iPSC glial chimeric mouse model of ALS/FTD. Dr. Matthew Harms, The Trustees of Columbia University in the City of New York: $40,000. Mechanisms and phenotypes of ALS caused by the novel ALS gene TBK1. Dr.Terry Heiman-Patterson, Drexel University: $240,000. Genetic modifiers of a murine motor neuron disease (G93ASOD1 transgenic mouse). Dr. Javier Jara, Northwestern University: $40,000. Understanding the role of traumatic brain injury in ALS. Dr. Yichang Jia, Tsinghua University: $80,000. Mechanistic studies in knock-in mouse models carrying human TDP-43 and FUS mutations. Dr. Mingchen Jiang, Northwestern University: $240,000. Development of hyperexcitability in synaptic activity of spinal motoneurons in mutant SOD1 (G93A) mice. Dr. Sebastian Kadener, Hebrew University of Jerusalem: $40,000. Unraveling the role of circular RNAs (circRNAs) in ALS pathogenesis. Dr. Clotilde Lagier-Tourenne, The General Hospital Corporation d/b/a Massachusetts General: $500,000. Testing therapeutic efficacy of human-derived antibodies targeting dipeptide-repeat proteins in C9orf72 disease. Dr. Patricia Lillo, Universidad de Chile Facultad de Medicina: $40,000. Temporal and spatial clusters of mortality rates by ALS in Chile (1990-2012). Dr. Daniel Mordes, President and Fellows of Harvard College: $40,000. Function of C9ORF72 in ALS. Dr. Roel Ophoff, The Regents of the University of California: $40,000. DNA helicases in C9ORF72 hexanucleotide repeat expansion in ALS. Dr. P. Hande Ozdinler, Northwestern University: $240,000. Comparative analysis of protein dynamics within healthy and vulnerable upper motor neurons reveal early detection markers and novel disease mechanisms. Dr. Henry Paulson, The Regents of the University of Michigan: $240,000. Defining the role of Ubiquilins in ALS/FTD. Dr. Mercedes Prudencio, Mayo Clinic Jacksonville: $240,000. ALS biomarker discovery in blood RNA. Dr. Kourosh Rezania, University of Chicago: $240,000. Assessment of intermuscular coherence as a biomarker for ALS. Dr. Rita Sattler, Dignity Health d/b/a St. Joseph's Hospital and Medical Center: $240,000. Role of synaptic dysfunction in C9orf72-mediated pathogenesis in patient-derived iPS neurons and in vivo animal models. Dr. J Paul Taylor, St. Jude Children's Research Hospital: $240,000. The role of RNA granule dynamics in ALS. Dr. Erik Ullian, The Regents of the University of California: $40,000. Loss of astrocyte Kir4.1 accelerates onset of ALS. Dr. Vladimir Uversky, The University of South Florida Board of Trustees: $40,000. Experimental and theoretical investigation of the structure and mechanism of aggregation of RNA-binding proteins TDP-43 and FUS. Role of intrinsic disorder and macromolecular crowding. Dr. Vivianna Van Deerlin, Trustees of the University of Pennsylvania: $106,977. A University of Pennsylvania-New York Genome Center collaboration to conduct a genomic search for novel genes and genetic risk factors in ALS and FTD. Dr. Kendall Van Keuren-Jensen, Translational Genomics Research Institute: $240,000. Assessment of extracellular vesicle contents in patients with ALS. Dr. Philip Wong, Johns Hopkins University: $160,000. Defining the RNA splicing role of TDP-43. Dr. Yong Jie Zhang, Mayo Clinic Jacksonville: $240,000. Mouse models of sense and antisense C9orf72 transcripts. Dr. Antonia Dominguez, Stanford University: $100,000. Functional analysis of C9orf72 mutations in ALS via targeted genome engineering. Dr. Fernande Freyermuth, Massachusetts General Hospital: $100,000. Targeting FUS misfolding to mitigate RNA processing alterations linked to ALS. Dr. Marian Hruska-Plochan, University of Zurich: $100,000. Deciphering the pathogenic mechanisms of C9ORF72 dipeptide proteins. Dr. David Medina, Dignity Health d/b/a St. Joseph's Hospital and Medical Center: $100,000. Modulating retinoid signaling as a therapeutic approach for ALS. Dr. Kasper Roet, The Children’s Hospital Corporation d/b/a Boston Children’s: $100,000. Which potassium channel drives ALS motor neuron hyperexcitability? Dr. Tao Sun, Stanford University: $100,000. Genome wide identification of RNA editing dysregulation and upstream regulators in ALS. Dr. Dejun Yang, University of Massachusetts Medical School: $100,000. Determine the mechanisms of ALS-associated Poly (GR) toxicity and screening for therapeutic drugs. Dr. Joseph Beckman, Oregon State University: $300,000. Preclinical investigation of CuATSM in mice and dogs. Dr. Joan Coates, The Curators of the University of Missouri: $236,636. Temporal regional PET imaging of the CNS EAAT2 protein in canine degenerative myelopathy as a disease model of ALS. General Electric Company, General Electric Company: $110,399. Longitudinal multimodal MRI study to characterize in vivo brain pathology in people with ALS. Dr. David Ennist, Origent Data Sciences, Inc.: $497,433. Prospective validation of ALS disease models and tools. Dr. Janine Kirby, University of Sheffield: $18,766. Establishing miRNA biomarkers in ALS patients associated with long and short disease duration. Dr. Robert Miller, CPMC Research Institute: $133,000. Establishing uniform methods of data collection in Epic ALS Centers. Dr. Benjamin Murdock, The Regents of the University of Michigan: $60,000. The immune system underlies Amyotrophic Lateral Sclerosis. Dr. Alex Sherman, Mass General Hospital – Research: $1,679,091. NeuroBANK as an accelerated clinical research environment: development, CORE services to ALS research community. Dr. Sara Shnider, Prize4Life, Inc.: $325,500. Expansion of the ALS research forum. Dr. Margaret Sutherland, NINDS: $2,500,000. NeuroLINCS DSGC. Dr. Bruce Trapp, Cleveland Clinic Foundation: $238,611. Postmortem MRI and pathology in ALS patients to identify biomarkers and evidence of oligodendrocyte dysfunction. Dr. Orla Hardiman, Trinity College Dublin: $200,000. Defining and addressing the complex needs of ALS caregivers. Dr. Emily Plowman, University of Florida: $199,971. Impact of combined inspiratory/expiratory respiratory training in ALS. Dr. Zachary Simmons, The Pennsylvania State University: $197,551. New opportunities for patient care: telemedicine with brain-computer interface communication. Dr. Nazem Atassi, Massachusetts General Hospital: $675,000. ALS One - Mapp ALS (Massachusetts ALS Partnership). Dr. Robert Brown, University of Massachusetts Medical School: $675,000. ALS One - Mapp ALS (Massachusetts ALS Partnership). Dr. Steven Perrin, The ALS Therapy Development Institute: $650,000. ALS ONE. Dr. John Costello, Children’s Hospital Corporation d/b/a Boston Children’s Hospital: $50,000. Message bank conversation and storage software for ALS patients. Dr. Dianne Goodwin, BlueSky Designs, Inc.: $50,000. Power positioning of speech devices and other essential equipment. Dr. Joshua Cohen, Amylyx Pharmaceuticals, Inc.: $750,000. Amylyx Pharmaceuticals, Inc.
Dr. Lindsey Hayes, American Academy of Neurology Institute: $240,000. Development of C9orf72 biomarkers. Dr. Cindy Ly, American Academy of Neurology Institute: $130,000. The role of TBK1 in autophagy and innate immunity in ALS. Dr. Andrea Malaspina, Queen Mary University of London: $60,000. Going dry: empowering neurofilament-based biomarkers studies for disease monitoring in amyotrophic lateral sclerosis. Dr. Eliahu Heldman, Lauren Sciences LLC: $100,000. Treatment of ALS by targeted delivery of GDNF to motoneurons using novel V-SmartTM nanovesicles. Dr. Aimee Jackson; Howard Weiner, Miragen Therapeutics, Inc.: $424,725. AntimiR-155 therapy for ALS. Dr. John Landers; Cathleen Lutz, University of Massachusetts Medical School: $469,678. Development and characterization of novel mouse models of ALS. Dr. Raymond Roos, The University of Chicago: $120,000. Targeting the unfolded protein response in mutant SOD1 induced ALS. Dr. J Paul Taylor; Jinghui Zhang; Michael Benatar, St. Jude Children's Research Hospital: $835,937. Whole genome sequencing of patients and families with deeply phenotyped ALS and related disorders. Dr. Jiou Wang, Johns Hopkins University: $400,000. Targeting proteotoxicity as the common denominator in ALS. Dr. Derrick Gibbings, University of Ottawa: $499,026. A drug delivery platform delivering silencing RNAs to motor neurons in vivo using exosomes. Dr. Chien Liang Glenn Lin, The Ohio State University: $500,000. Development of small-molecule activators of glutamate transporter EAAT2 for ALS. Dr. Richard Keenan, OptiKira, LLC: $498,500. Validating inhibition of IRE1alpha kinase/RNase as a therapeutic approach to ALS. Dr. Thomas Lloyd, Johns Hopkins University: $500,000. Preclinical development of KPT-350 for C9-ALS. Dr. Alberto Ascherio, President and Fellows of Harvard College: $262,500. Nutrition and disease prevention: examining polyunsaturated fats and risk of ALS. Dr. Gene Yeo, University of California: $240,000. Comprehensive analysis of RNA localization and transport mechanisms in wildtype and ALS motor neurons. Dr. Brian Black, The Regents of the University of California, San Francisco: $300,000. The role of Zfp106 in RNA metabolism and ALS. Dr. Bradley Foerster, The Regents of the University of Michigan: $294,017. Capturing the temporal phases of neuroinflammation in ALS using multi-modal advanced imaging. Dr. Jada Lewis, University of Florida Board of Trustees: $240,000. New mouse models to dissect out the function of the ALS-associated protein Matrin. Dr. Thomas Lloyd, Johns Hopkins University: $300,000. Mechanism of cytoplasmic protein aggregation and neurodegeneration in Drosophila models of C9ORF72-ALS. Dr. Jeffrey Macklis, President and Fellows of Harvard College: $300,000. Potential abnormalities of corticospinal-specific growth cone proteomes, RNA and precise circuit wiring in ALS mice. Dr. Thomas Maniatis, The Trustees of Columbia University in the City of New York: $300,000. Single cell studies of TDP-43 mutations on ALS disease progression. Dr. Mervyn Monteiro, University of Maryland, Baltimore: $150,000. Gene profiling to determine the initiator mechanisms involved in disease in a UBQLN2 mouse model of ALS-FTD. Dr. Wilfried Rossoll, Emory University: $300,000. Molecular mechanisms of PABPN1-mediated suppression of TDP-43 toxicity. Dr. Jeffrey Rothstein, Johns Hopkins University: $300,000. ALS C9orf72 nucleotide repeat expansion disrupts nucleocytoplasmic transport. Dr. Gene Yeo, University of California San Diego: $300,000. Discovery of stress granule components in models of ALS. Dr. Sandra Almeida, University of Massachusetts Medical School: $50,000. Reducing repeat toxicity as a therapeutic approach in C9ORF72 ALS/FTD. Dr. Nadine Bakkar, Dignity Health d/b/a St. Joseph's Hospital and Medical Center: $50,000. Disruption of blood-cerebral spinal fluid barrier integrity in ALS. Dr. Roger Bannister, University of Colorado Denver: $50,000. Rad is an agent of muscle atrophy and neuromuscular junction decline. Dr. Carlos Castañeda, Syracuse University: $50,000. Effects of Ubiquilin-2 ALS mutations on structure, dynamics, and interactions with other ALS-associated proteins. Dr. Kausiki Datta, University of Florida: $50,000. High-throughput screening assay to identify small molecules that decrease transcription of the C9orf72 G4C2/G2C4 expansion. Dr. Mai ElMallah, University of Massachusetts Medical School (check number): $50,000. Gene therapy for upper airway dysfunction and respiratory insufficiency in an ALS mouse model. Dr. Nicolas Fawzi, Brown University: $50,000. Disruption of TDP-43 granule assembly by ALS mutations. Dr. Marco Peviani, Dana-Farber Cancer Institute, Inc.: $50,000. Development of microglia-targeted MRI/PET traceable nanovectors as innovative theranostic platform for investigating and shaping microglia reactivity to improve ALS therapy. Dr. Peter Todd, The Regents of the University of Michigan: $25,000. Involvement of C-terminal fragment in C9ALS/FTD RAN-translated dipeptide repeat toxicity. Dr. Chunlai Wu, Louisiana State University Health Sciences Center - N.O. : $50,000. Enhancing Mask activity as a therapeutic approach for treating ALS. Dr. Bruno Miguel da Cruz Godinho, University of Massachusetts Medical School: $100,000. Silencing mutant SOD1 and C9orf72 in vivo using innovative hydrophobic siRNA scaffolds: a novel therapeutic path for the treatment of ALS. Dr. Amanda Gleixner, University of Pittsburgh: $100,000. Linking impaired nucleocytoplasmic trafficking in C9ORF72 ALS to altered nuclear pore complex O-linked N-acetylglucosamine (O-GlcNAc). Dr. Jone Lopez-Erauskin, Ludwig Institute for Cancer Research Ltd: $100,000. Identify key molecular targets to counteract muscle denervation in ALS. Dr. Jeanne McKeon, University of Massachusetts Medical School: $100,000. Disruption of actin dynamics as a pathogenic mechanism in ALS. Dr. Sergey Stavisky, The Board of Trustees of the Leland Stanford Junior University: $100,000. Clinically-useful brain-machine interface control of a robotic prosthetic arm by people with ALS. Dr. Tiffany Todd, Mayo Clinic Jacksonville: $100,000. Modeling selective vulnerability and disease specific functions in mice by the comparison of C9orf72 repeat models to a novel disease control. Dr. Vicente Valenzuela, B N I, Faculty of Medicine, University of Chile: $100,000. Gene therapy to attenuate ER stress alterations in ALS. Dr. Jonathan Glass, Emory University: $64,000. Project MinE. Dr. Ettore Beghi, IRCCS Mario Negri Institute for Pharmacological Research: $1,000,000. The effects of RNS60 on ALS biomarkers. Dr. Timothy Miller, Washington University in St. Louis: $499,966. ALS ACT: TDP43 pet tracer challenge. Dr. Dexter Ang, Pison Technology Inc: $100,000. EMG communication and control device. Dr. Peter Desain, Radboud University: $300,000. Brain computer interface. Dr. Ammar Al Chalabi, King’s College London: $150,000. The ALS Online Genetics Database, ALSoD. Dr. Stephen Goutman, The Regents of the University of Michigan: $200,000. Utility of 3D printed masks for improving compliance and efficacy of non-invasive ventilation in subjects with amyotrophic lateral sclerosis: a pilot feasibility study. Dr. Stephen Selkirk, Cleveland VA Research Foundation: $58,320. Utilizing Telehealth technologies to manage the ALS patient. Dr. David Walk, University of Minnesota: $134,392. A pilot study of lung volume recruitment combined with expiratory muscle strength training to facilitate ventilatory and bulbar function in ALS. Dr. Nicholas Olney, American Academy of Neurology Institute: $86,667. 2017 Clinical research training fellowship in ALS research. Dr. Sabrina Paganoni, American Academy of Neurology Institute: $160,000. 2017 Clinician Scientist Development award in ALS research. Dr. Nicholas Maragakis, Johns Hopkins University: $200,000. NLY01: A GLP-1 analog for the treatment of ALS. Dr. Raymond Roos, The University of Chicago: $200,000. Combating ER stress in G85R ALS mice. Dr. Jeffrey Agar, Northeastern University: $300,000. Tethering cysteine pairs with cyclic disulfides: a method for stabilizing fALS SOD1 variants. Dr. Carlos Castañeda, Syracuse University: $300,000. Molecular basis and effects of Ubiquilin-2 phase separation on association with ALS-linked proteins. Dr. Claudia Fallini, University of Massachusetts Medical School: $300,000. Dissecting the link between cytoskeletal disruption and mRNA processing in ALS. Dr. Antonella Favit-VanPelt, Thera Neuropharma: $200,000. Selection of a novel target clinical candidate for the treatment of ALS. Dr. Magdalini Polymenidou, University of Zurich: $300,000. Understanding the role of dynamic polymerization of TDP-43 in health and disease. Dr. Mart Saarma, University of Helsinki: $250,000. CDNF and CDNF variants - novel therapy for ALS. Dr. Shuying Sun, The Johns Hopkins University: $300,000. RAN translation of hexanucleotide repeats in C9ORF72-ALS/FTD. Dr. J Paul Taylor, St. Jude Children's Research Hospital: $300,000. How disturbance in stress granule dynamics is converted into TDP-43 pathology. Dr. Randal Tibbetts, The Board of Regents of the University of Wisconsin System: $300,000. Drosophila models of ubiquilin-associated ALS. Dr. Marka Van Blitterswijk, Mayo Clinic Jacksonville: $250,000. Identification of novel biomarkers for C9ORF72-linked diseases, combining a targeted approach with an unbiased screen. Dr. Philip Wong, The Johns Hopkins University: $300,000. TDP-43 splicing repression as a therapeutic target for ALS. Dr. Chunlai Wu, Louisiana State University Health Sciences Center - N.O. : $300,000. Enhancing Mask/ANKHD1 activity as a therapeutic approach for treating ALS. Dr. Jacob Ayers, University of Florida Board of Trustees: $50,000. Developing a mouse model to study the cell-type specific effects on ALS disease spread. Dr. Sandrine Da Cruz, Ludwig Institute for Cancer Research: $50,000. Identifying molecular targets to enhance muscle innervation in Amyotrophic Lateral Sclerosis. Dr. Meredith Jackrel, Washington University: $50,000. Countering TDP-43, FUS, and dipeptide repeat protein toxicity with engineered Hsp104 variants. Dr. Timothy Lu, Massachusetts Institute of Technology: $50,000. Ameliorating TDP-43-associated pathogenesis with global transcriptional perturbations. Dr. Megan McCain, University of Southern California: $50,000. Engineering robust and functional human neuromuscular junctions in a dish for ALS disease modeling and drug screening. Dr. Mariana Pehar, Medical University of South Carolina: $50,000. RAGE inhibition as a therapeutic approach in ALS models. Dr. Philip Smaldino, Ball State University: $50,000. Enzymatic regulation of toxic G-quadruplex structures in ALS cells by G4 resolvase 1. Dr. Krista Spiller, The Trustees of the University of Pennsylvania: $50,000. Uncovering ALS-related changes in motor circuits and their functional consequences on subsequent disease progression in rNLS8 mice. Dr. Gabriella Viero, Institute of Biophysics CNR: $50,000 . Tag-free axonal translatome of mouse models of ALS/FTD to reveal defects in axonal mRNA transport and association to axonal polysomes. Dr. Qiang Zhu, Ludwig Institute for Cancer Research: $50,000. Determining whether gain of toxicity from ALS/FTD-linked hexanucleotide repeat expansion synergizes with reduced C9ORF72 function to drive age-dependent ALS/FTD. Dr. Sara Ackerman, University of Oregon: $100,000. Contributions of astrocyte function and dysfunction to ALS. Dr. Meredith Corley, Regents of the University of California UCSD: $100,000. Accurate RNA structural studies of transcripts targeted by RNA binding protein hnRNP A2/B1. Dr. Anthony Giampetruzzi, University of Massachusetts Medical School: $100,000. Identifying therapeutics for ALS using ALS-linked mutant Profilin-1. Dr. Yue Li, Scripps Florida: $100,000. Development of RNA-templated small molecules to treat C9 ALS/FTD. Dr. Nibha Mishra, Massachusetts General Hospital: $100,000. Identifying determinants of FUS nucleocytoplasmic localization by CRISPR/Cas9 genetic screen in ALS patient cells. Dr. Maria Purice, St. Jude Children's Research Hospital: $100,000. Linking TDP43 pathology with stress granule dynamics. Dr. Don Cleveland, Ludwig Institute for Cancer Research: $1,000,000. Neuro collaborative. Dr. Steven Finkbeiner, The J David Gladstone Institute: $1,000,000. ALS Association - Neuro Collaborative - identification and validation of therapeutic targets and developments of therapeutics for ALS. Dr. Clive Svendsen, Cedars-Sinai Medical Center: $1,000,000. ALS on a Chip. Dr. Jonathan Glass, Emory University: $102,489. Project MinE. Dr. John Landers, University of Massachusetts Medical School: $568,896. Project MinE. Dr. Don Cleveland, Ludwig Institute for Cancer Research: $60,000. Trans-cellular transmission of misfolded TDP-43 and ALS progression. Dr. Chad Heatwole, University of Rochester: $225,241. Development of a clinically relevant outcome measure for ALS therapeutic trials. Dr. Adele McCormick, University of Westminster: $327,000. HERV-K molecular studies in Amyotrophic Lateral Sclerosis. Dr. Markus Otto, University Hospital of Ulm: $200,000. Neurofilament assay. Dr. Michael Bereman, NC State University, Raleigh: $100,000. Development of a protein panel of diagnostic and prognostic value in ALS. Dr. Kjetil Bjornevik, Harvard T.H. Chan School of Public Health: $69,880. Pre-symptomatic neurofilament light chain as biomarker in amyotrophic lateral sclerosis. Dr. Oleg Butovsky, Brigham and Women’s Hospital: $100,000. Identification of proteomic signatures in T cells in ALS. Dr. Timothy Miller, Washington University in St. Louis: $50,000. Determining if motor neuron-specific miRNA are biomarkers for motor neuron disease. Dr. Mercedes Prudencio, Mayo Clinic: $65,000. Trancriptome biomarker discovery in ALS. Dr. Laura Ranum, University of Florida: $100,000. Presymptomatic biomarkers of C9-ALS/FTD. Dr. Gerard Sanacora, Yale University School of Medicine: $99,938. Characterization of mitochondrial function and neuron-glial (glutamate/GABA) neurotransmitter cycling in a mouse model (SOD1-G93A) of ALS. Dr. Claudio Soto, University of Texas Health Science Center at Houston: $50,000. Development of a biochemical diagnosis for ALS by high-sensitive detection of misfolded protein oligomers in biological fluids. Dr. Dieter Willbold, Forschungszentrum Jülich GmbH: $47,700. Aggregated TDP43 as potential biomarker in ALS. Dr. Veronique Belzil, Mayo Clinic: $100,000. Identify mediators of neuronal susceptibility in amyotrophic lateral sclerosis. Dr. Renée Douville, The University of Winnipeg: $300,000. Integrase inhibitors as a therapeutic modality for ALS. Dr. Derrick Gibbings, University of Ottawa: $300,000. Delivery of silencing RNAs targeting Ataxin-2 and C9ORF72 repeat intron for the treatment of ALS. Dr. Pallavi Gopal, Yale University: $200,000. Effect of Ataxin-2 intermediate length polyglutamine expansion on TDP-43 RNP granule dynamics. Dr. Anne Hart, Brown University: $100,000. Mechanisms underlying neuronal dysfunction and degeneration in ALS caused by mutation of PFN1. Dr. John Landers, University of Massachusetts Medical School: $300,000. Identification of the molecular mechanisms of KIF5A mutations towards the development of ALS vs. HSP. Dr. Katharine Nicholson, Massachusetts General Hospital: $300,000. Early markers of disease in C9ORF72 ALS. Dr. Udai Pandey, University of Pittsburgh Medical Center: $300,000. Identifying genetic and small molecular modifiers of FUS-mediated ALS. Dr. Eric Schmidt, The Rockefeller University: $300,000. Identifying molecular mechanisms for the selective degeneration of upper motor neurons in the cortex of ALS patients. Dr Elijah Stommel, Dartmouth College: $300,000. Investigating aerosolized cyanobacteria in Amyotrophic Lateral Sclerosis. Dr. Evelyn Talbot, University of Pittsburgh: $100,000. The role of ambient air pollution and other environmental and occupational exposures and risk of ALS: a nested case control study. Dr. Ludo Van Den Bosch, VIB-KU Leuven Center for Brain & Disease Research: $255,000. Identification, characterization and validation of modifiers of repeat RNA toxicity in C9orf72 amyotrophic lateral sclerosis (ALS). Dr. Christine Vande Velde, Centre de recherche du Centre d'hospitalier de l'Universite de Montreal (CRCHUM): $200,000. Determining the consequences of a TDP-43 mediated splice event in hnRNP A1. Dr. Alison Axtman, University of North Carolina at Chapel Hill: $50,000, Rational design of first-in-class TBK1-activating small molecules. Dr. Jacqueline Chen, Cleveland Clinic: $49,925. MRI detection and molecular characterization of motor cortex changes associated with lower motor neuron loss. Dr. Matthew Cykowski, The Methodist Hospital Research Institute: $40,000. Selective neuronal vulnerability and resistance to pTDP-43 pathology in the primary motor and visual cortices of ALS patients. Dr. Jeanine Heckmann, University of Cape Town, $31,576, The adaptation and norming ALS-associated cognitive assessment tools for the African context. Dr. Yichang Jia, Tsinghua University: $100,000. To test an E3 ligase upregulated in an ALS mouse model as a potential therapeutic target. Dr. Danilo Medinas, Biomedical Neuroscience Institute: $50,000. Gene therapy strategy to strength neuromuscular junction in ALS. Dr. Derek Prosser, Virginia Commonwealth University: $50,000. Characterization of AVL9 as a genetic suppressor of ALS8 (VAPB-P56S) phenotypes. Dr. Nortina Shahrizaila, University of Malaya: $50,000. Genetic study of ALS in a multi-ethnic Asian population. Dr. Marka Van Blitterswijk, Mayo Clinic Jacksonville: $100,000. Discovery of genetic disease modifiers accounting for substantial variability in survival after ALS onset. Dr. Eric Vitriol, University of Florida: $50,000. The actin cytoskeleton as a novel pathway in ALS pathogenesis. Dr. Orla Hardiman, Trinity College Dublin: $200,000. A randomised controlled study of psychological intervention in ALS to address the significant and complex mental health issues facing caregivers. Dr. Melinda Kavanaugh, University of Wisconsin-Milwaukee: $200,000. YCare South Africa: Building community based ALS/MND caregiver interventions. Dr. Emily Plowman, University of Florida Gainesville: $179,850. The impact of nuedexta on bulbar physiology and function in ALS. Dr. Anne-Marie Wills, Massachusetts General Hospital: $197,627. E-health Application To Modify ORal Energy intake and Measure Outcomes REmotely in ALS Clinical Trial (EAT MORE2 in ALS Clinical Trial). Dr. Stanley Appel, Houston Methodist Neurological Institute: $375,000. Expanded population of regulatory T-Cells (EPAR T-Cells) for people with Amyotrophic Lateral Sclerosis. Dr. Sabrina Paganoni, Massachusetts General Hospital: $375,000. Expanded population of regulatory T-Cells (EPAR T-Cells) for people with Amyotrophic Lateral Sclerosis. Dr. Steven Perrin, ALS TDI/Analexis: $994,000. Clinical development of AT-1501, a humanized antibody targeting CD40LG, in ALS patients. Dr. Peter Creigh, University of Rochester (American Brain Foundation): $150,000. Telemedicine in ALS research: the utility of virtual visits and remote outcome measure collection. Dr. Antonius Bunt, Izumi Biosciences Inc.: $100,000. Complement DoD grant W81XWH-16-1-0072 for PK enhancement of cART in HERV-K + ALS-FTD patients to reverse neuroinflammation, multi drug resistance and improve outcomes. Dr. Steven Burden, NYU Medical School: $125,000. Reducing leg muscle denervation in SOD1 G93A mice with an agonist antibody to MuSK. Dr. Don Cleveland, Ludwig Institute for Cancer Research: $500,000. Antisense oligonucleotide therapy in ALS by restoring expression of stathmin-2. Dr. Daniel Elbaum, QurAlis Corporation: $500,000. Development of a clinical candidate targeting the TBK1 branch of the autophagy pathway for the treatment of ALS. Dr. Samar Hasain, University of Liverpool: $495,802. Development of ebselen and its derivatives as a potential drug for ALS. Dr. Eliahu Heldman, Lauren Sciences LLC: $75,000. Treatment of ALS by targeted delivery of GDNF to motoneurons using novel V-SmartTM nanovesicles. Dr. Justin Ichida, University of Southern California: $500,000. Development of novel PIKfyve inhibitors for C9orf72 ALS. Dr. Clotilde Lagier-Tourenne, Massachusetts General Hospital: $250,000. Developing immunotherapy approaches targeting pathological forms of TDP-43 in ALS. Dr. John Landers, University of Massachusetts Medical School: $200,000. Investigating pridopidine, a Sigma-1 receptor activator, as a novel therapeutic treatment for ALS. Dr. Wen Hwa Lee, University of Oxford: $200,000. Generation and validation of open access recombinant monoclonal antibodies for reproducible ALS research. Dr. Giovanni Manfredi, Weill Cornell Medicine: $500,000. Exploring the disease-modifying effects of EH301 in mouse models of ALS. Dr. Timothy Miller, Washington University in St. Louis: $77,750. Pathological analysis of selective authophagy in sporadic and familial ALS. Dr. John Ravits, The Regents of the University of California: $47,250. Pathological analysis of selective authophagy in sporadic and familial ALS. Dr. John Ravits, The Regents of the University of California: $50,000. Ataxin-2 Neuropathology in Sporadic ALS. Dr. Brigitte van Zundert, Universidad Andrés Bello: $498,194. Synergistic dual target approach to ALS therapy: simultaneous activation of two complementary targets, neuronal Kv7.2/3 channels and glial TSPO. Zuoshang Xu, University of Massachusetts Medical School: $330,000. Clearing protein aggregates without neuroinflammation - a new strategy to treat ALS. Edward Barbieri, University of Pennsylvania: $100,000. Programming human chaperone systems against neurodegenerative disease. Alyssa Coyne, Johns Hopkins University: $100,000. Mechanistic insights into C9orf72 mediated disruptions in the nuclear pore complex. Jorge Gomez, NICHD / National Institutes of Health: $100,000. Optogenetic activation of the ALS-linked DLK pathway for drug discovery. Ananya Ray-Soni, Massachusetts General Hospital: $100,000. Targeting TDP-43 pathology in C9ORF72-mediated ALS. Andrei Ursu, Scripps Florida: $100,000. Alleviation of pathological mechanisms of genetically defined ALS by small molecules targeting RNA G4C2 repeat expansions. Jonathan Glass, Northeast ALS Consortium (NEALS): $60,000. Community-based genetic testing and tele-genetic counseling for patients with ALS. Gilles Guillemin, Macquarie University: $60,000. New directions for early diagnosis of MND: a large-scale longitudinal analysis of multiple biomarkers to find diagnostic and prognostic “fingerprints”. InnoCentive, Inc.: $10,250. Teva crowdsourcing challenge: novel therapeutics targets for disorders of the central nervous system. Iya Khalil, GNS Healthcare, Inc: $500,000. Building an ALS disease model and user interface via GNS Healthcare REFS big data platform. Christopher McDermott, The University of Sheffield: $20,000. Task force to provide unbiased analysis of Diaphragm Pacing Studies in ALS. Salil Patel, Pison Technology, Inc.: $50,000. Neuromuscular sensing system usability testing for ALS patients. Hemali Phatnani, New York Genome Center: $3,450,000. The Center for Genomics of Neurodegenerative Disease (CGND) ALS Consortium. Taconic Biosciences Inc, Taconic Biosciences Inc: $62,854.48. Maintain the SOD1 breeding colony in 2014. Taconic Biosciences Inc, Taconic Biosciences Inc: $81,733. Maintain the SOD1 breeding colony in 2015. Taconic Biosciences Inc, Taconic Biosciences Inc: $80,543. Maintain the SOD1 breeding colony in 2016. Taconic Biosciences Inc, Taconic Biosciences Inc: $93,692. Maintain the SOD1 breeding colony in 2017. Taconic Biosciences, Inc, Taconic Biosciences Inc: $95,639: Maintain the SOD1 breeding colony in 2018. Dr. Merit Cudkowicz, The General Hospital Corporation d/b/a Massachusetts General: $356,199. TREAT ALS NEALS clinical trial network year 7. Dr. Merit Cudkowicz, The General Hospital Corporation d/b/a Massachusetts General: $376,136. Northeaset ALS Consortium (NEALS) Year 8. Dr. Merit Cudkowicz, The General Hospital Corporation d/b/a Massachusetts General: $1,663,811. TREAT ALS NEALS clinical trial network. Dr. Jonathan Glass, Northeast ALS Consortium (NEALS): $154,544. Northeast ALS Consortium (NEALS) Infrastructure. Dr. Jeremy Shefner, Barrows Neurological Institute: $110,880. TREAT ALS NEALS clinical trials network (BNI Portion) [Year 7]. Dr. Jeremy Shefner, St.Joseph's Hospital and Medical Center: $118,014. Northeast ALS Consortium (NEALS) year 8. Dr. Jeremy Shefner, Dignity Health d/b/a St. Joseph's Hospital and Medical Center: $958,010. TREAT ALS NEALS Clinical Trial Network.